This beautiful, handpainted yellow embossed Carlton Ware design was introduced in the late 1940s under the Fruit Basket range and continued into the early 1950s. It was made in two colourways - green and this one on offer, yellow. 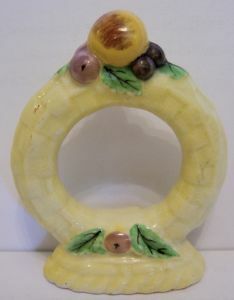 The brightly handpainted Napkin Ring in yellow has a yellow ripening cherry at the top. The embossed design and finish could almost suggest a mottled effect similar to crazy paving. It measures approx 3 inches (7.5 cms) in length with a maximum width of 2.25 inches (just under 5.5 cms). The base is backstamped appropriately. There is a trace of very light crazing but no chips/nibbles.